Ideal for people looking to store things for which they might not have space for at home; or those wanting to store a smaller number of things, and do not require the use of a full 20ft container. Your unit can be accessed during normal business hours (including Saturday mornings) and arrangements can be made by telephone if access is required at other times. 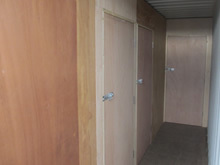 Indoor and outdoor steel containers are available, as well as smaller storage containers. You hold the key to your container with all containers housed inside our secure compound or storage building. Your container can be accessed during normal business hours (including Saturday morings) and arrangements can be made by telephone if access is required at other times. Store your car or motorbike off the road for any length of time with Guardian Storage. Ideal when going abroad, or if you are away from home for any reason. We use specialist equipment to store your family car, classic car or valuable car in a steel container within our secure compound. As always you hold the key and you have access to your car whenever you need it. Store cars of just about any length (up to 40ft) and virtually all motorcycles. 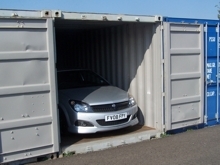 Your vehicle is stored out of sight, in a dust-free, light-free (no mould or UV damage), fire-resistent dedicated container. Store your documents in induvidual fire resistant containers. You hold the keys to your induvidual steel container, housed in the Guardian Storage Warehouse. 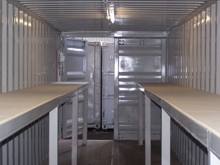 Document containers are fitted with lights and shelving to make document storage and access easy. You can deliver, sort and collect your documents at your own pace, storing anything (not just boxes of paper) to help keep your office clutter free. 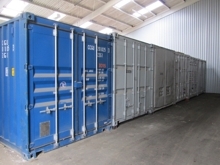 A standard 40ft container can hold 800 banker's boxes. 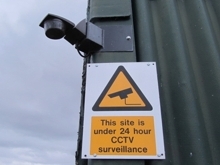 CCTV and outside lights within our high security fenced compound help keep your goods secure. PIR (Passive Infra-Red) lights are used for extra security in low light conditions. Each steel container is locked with the customer keeping the key. The risk of fire is greatly reduced as induvidual customer's goods are stored in seperate steel fire-resistant containers. The use of these steel shipping containers keeps your goods safe and makes it easy to access. The warehosue is constructed from non-flamable materials. 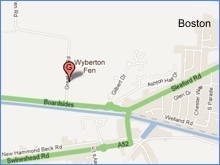 Guardian Store is located in Boston, Lincolnshire and is within easy reach of Sleaford and Spalding. Guardian Storage is 45 minutes from Grantham, 50 minutes from Peterborough, 1 hour from Kings Lynn and 1.5 hours from the East Midlands Airport by car. Click here to see Guardian Storage on a map.